New Balance Vazee Prism v2 are stability performance running shoes. 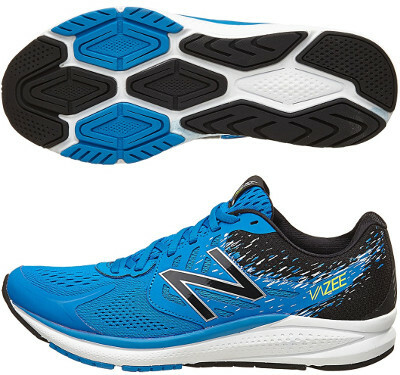 The New Balance Vazee Prism v2 becomes a less aggressive running shoes to better suit among the racing 1500 v3, classic trainer 860 v7 and more innovative Fresh Foam Vongo. As summary, the Vazee Prism v2 features support for mild or moderate pronation combined with great response and enough cushioning for uptempo training or long distances up to marathon. Annual release means upper update from its predecessor Vazee Prism. A more breathable fabric (in a similar way to Flyknit from Nike or PrimeKnit from Adidas) in the forefoot to adapt better to different movement and new heel counter replacing "deconstructed" one for improved stability are the more visible changes although increasing eyelets up to seven for custom and snug fit does not go unnoticed. Minor changes take place in midsole which is made of REVlite® foam featuring great blend of cushioning and response with medial post (double density) for progressive pronation control. Outsole changes a bit following 4 elements configuration in the forefoot from its counterpart for neutral runners Vazee Pace v2 looking for quicker toe-off.